What And Where Is The Dardanelles? Sometimes referred to as the Hellespont and sight of Gallipoli, this Turkish strait connects the Sea of Marmara with the Mediterranean and Aegean Seas. The Dur Yolcu monument to the fallen soldiers at Gallipoli in World War I (center of image) as seen from offshore upon the Dardanelles Strait. The Dardanelles is a narrow, 65-mile long strait of water in northwestern Turkey that separates Europe and Asia, and is one of the world’s busiest maritime passages. The strip’s other name is the Hellespont, and it’s found between Southwest Asia, and Southeast Europe. The Black and Mediterranean Seas are effectively linked by the Dardanelles strait. According to a Greek myth, the strip was named Hellespont after a girl called Helle as when she was about to be sacrificed with her brother Phrixus, a ram adorned with a golden fleece rescued and carried them away on its back, and flew from Greece northwards. Along the way, Helle fell into the sea, and the body of water was named after her, according to Livius History. The formation of the Dardanelles strait occurred over a span of time 2 to 65 million years ago after the Arabian, Indian, and African tectonic plates collided with European and Asian plates. The resulting faults formed a rugged terrain in western Turkey, as well as the Alps and Himalayan mountain ranges, according to Earth’s Encyclopedia. Historically, the strait has generated a number of international conflicts, the most notable being the Gallipoli Campaign during World War I. As the Dardanelles was the only usable strait being between the Black Sea in the east and Mediterranean Sea to the west, it was a strategic prize for both sides. In 1914, a young admiral named Winston Churchill called for the attack of the Dardanelles as a ploy to weaken the Germans. On the 19th of February, 1915, British and French naval forces attacked the Dardanelles. However, they suffered many casualties due to the mines planted by the enemy Ottoman Army on the battlefield, and by mid-January of 1916 they left defeated, and Churchill’s was humiliated as a strategist. According to the US Energy Information Administration (EIA), the Dardanelles is one of three Turkish straits vital as oil export routes for Russia, the European Union, and several nearby Asian countries. The other two are the Bosporus and the Sea of Marmara. In 2013, 2.9 million barrels per day passed through this Turkish waterway, of which 70 percent was crude oil, and the rest various other petroleum products. The Ukraine also exports many of its grains to the rest of the world through the Dardanelles. 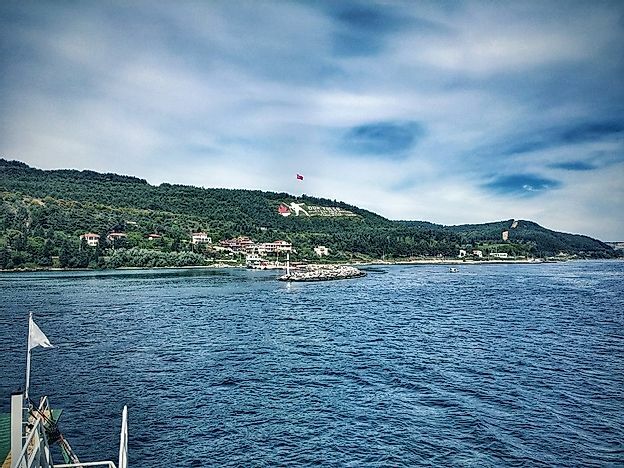 The waterway is also vibrant with tourism, as tourists are especially fond of visiting the Dardanelles to view the World War I Gallipoli Campaign battle sites and memorials. There is also a cemetery where visitors can pay homage to the lives lost in past battles, dating back to the ancient Greeks and the Ottoman Empire. There is diverse marine biodiversity in the three Turkish waterways, though this is largely dictated by prevailing ecological conditions and modernization. According to the European Union’s Framework Programs for Research and Technological Development, 507 of 795 Turkey's species of native marine flora are found in the southern coasts where these three straits are in the country. Tensions and conflicts along the Dardanelles, along with the other two straits, occur with countries that use them as passageways for their ships. Diplomatic spats between Turkey and Russia are common, and at times cause Russian ships to be prohibited by Turkey from using its straits. In 2015, after Turkey shot down a Russian plane, there was increased tension that threatened peace, especially along the nearby Bosporus Strait. Ferry and cargo ship collisions also occur here, the most recent being one in 2016 that caused damage on ships, though no human casualties occurred from the event. Water pollution along the three straits also occurs due to oil spills from ships. In 2003, a Georgian ship broke into two, and 500 metric tons of oil spilled into the Bosporus Strait's waters.